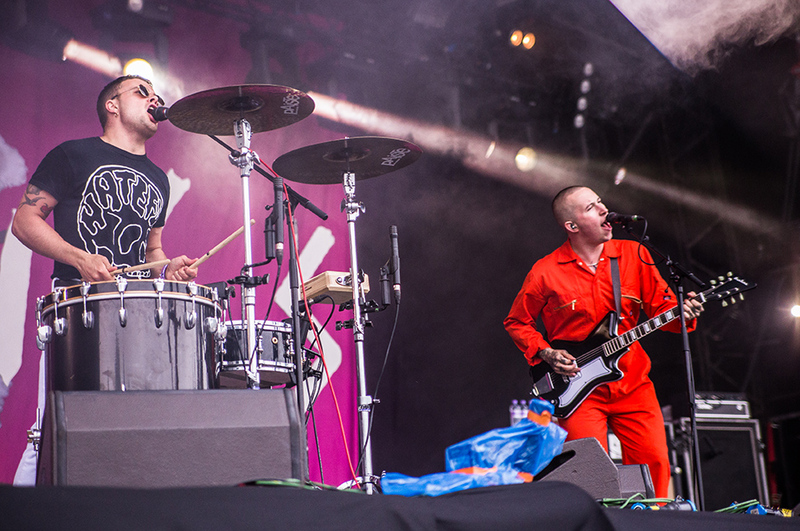 The Kent punk duo were on hand to kick the festival off with an explosive show early on Friday afternoon at the BBC Radio 1 Stage. Fresh from the release of their debut album ‘Are You Satisfied?’ and an awesome Glastonbury performance, they got the relatively small Scottish crowd going. Ending a set which included tracks from the album as well as some old favourites in true rock and roll style with a stage dive. Isaac and Laurie also demonstrated their talent with an acoustic rendition of their album’s title track Are You Satisfied? in BBC Three’s studio for the hosts of the T in the Park coverage, Clara Amfo and Angela Scanlon. It proved to be a good day for Kent, as the next memorable show of the day came from the one and only Norman Cook. The iconic DJ made his first T in the park appearance since the late nineties on Friday evening. An extensive set was opened by the epic ‘Eat, Sleep, Rave, Repeat’. The King Tut’s tent was absolutely packed, which made for an electric atmosphere. The show-stopping set included several mixes of hits such as ‘Renegade Master’ and ‘Right Here, Right Now’. 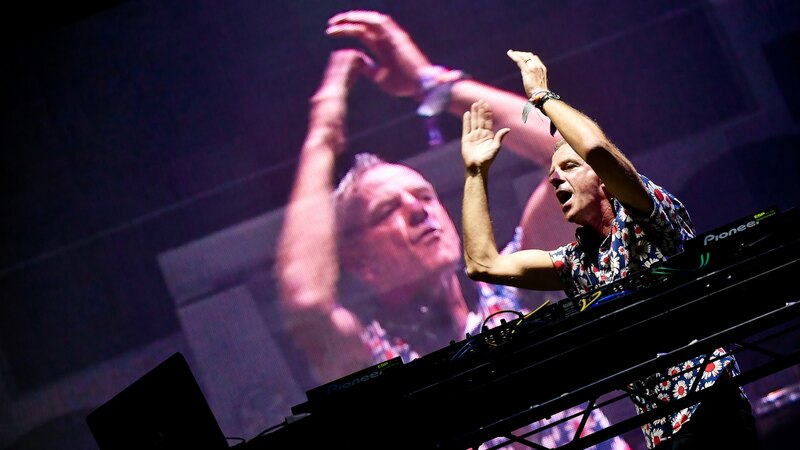 Fatboy Slim also remixed other DJs such as Scottish superstar DJ Calvin Harris who released a remix of Eat, Sleep, Rave, Repeat in 2014. Friday night’s headliner was Kasabian. 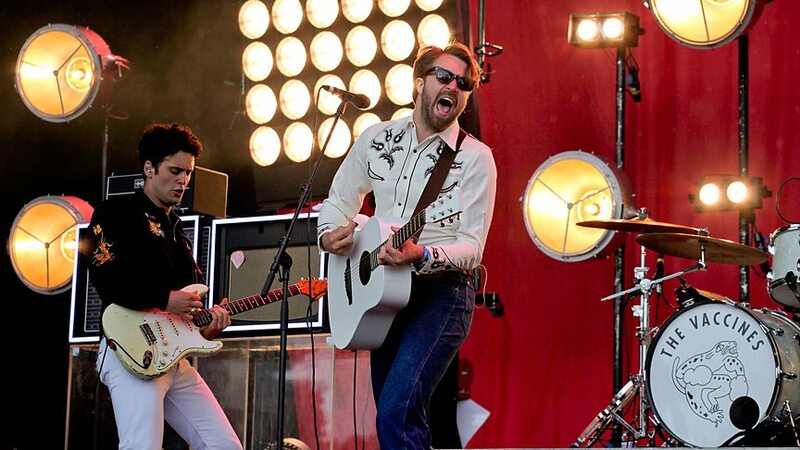 It was the Leicester band’s fourth T in the Park headline slot, having first headlined the festival back in 2004. Kasabian put on a real headline show, with lots of crowd interaction and mesmerising lighting effects. They played a handful of tracks from their album 48:13 which was widely recognised as one of the best albums of 2014. They also played some songs from old albums such as ‘Underdog’ and ‘Club Foot’ for their adoring cult following and even a handful of covers of everything from Jim Morrison to Fatboy Slim. Heavy rain did not bother the Scottish crowd one bit, who sung along to every line and were up on shoulders, flares in hands. Towards the end of the set, lead guitarist, Serge Pizzorno set down his guitar and picked up the mic to join the crowd for ‘Treat’, a track from 48:13. 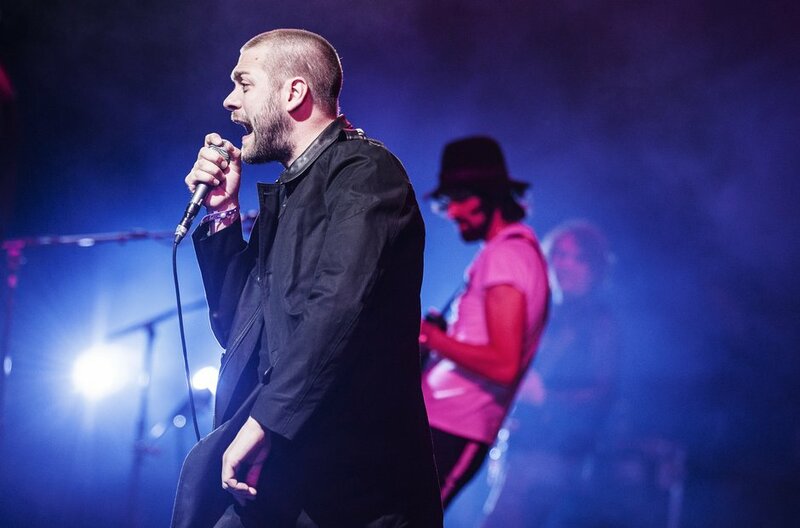 In what the band introduced as their last song, vocalist Tom Meighan led the T in the park crowd in a singalong of fan favourite ‘Fire’. The Leicester lads departed for a few minutes and returned to the main stage for an awesome encore which was kicked of by arguably the standout track of 48:13, ‘Stevie’. Next up was ‘Vlad The Impaler’ which saw Tom Meighan get the massive crowd hyped up with his shouts of “get loose! get loose!”. To end what had truly been a memorable live show was a fan favourite, back from 2004, Kasabian’s breakthrough L.S.F. Following up a noisy set from young Irish band The Strypes early Saturday afternoon, was Circa Waves. If the newcomers’ set at Glastonbury’s John Peel Tent a fortnight earlier, where frontman Kieran Shudall had sung a whole track whilst crowd surfing, was anything to go by, this would be brilliant. And it was. 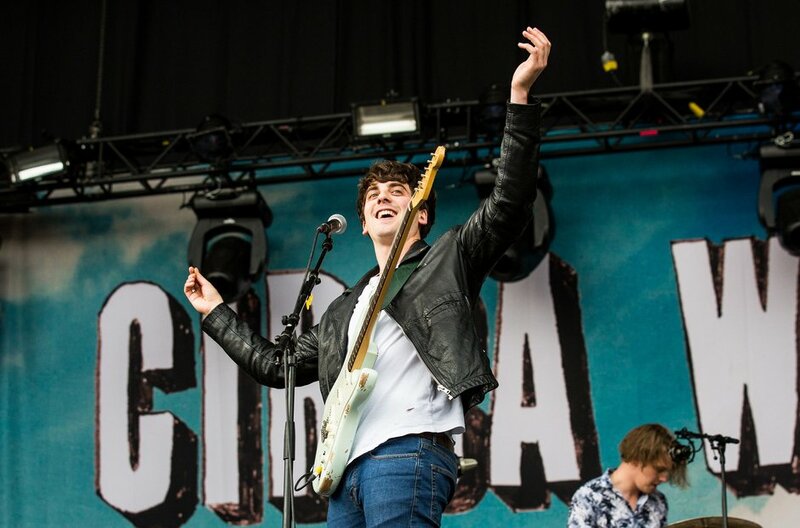 The scousers brought their fast-paced indie pop-rock to the crowd which had built up in front of the Radio 1 Stage, prompting sing-alongs to tracks from their newly released debut album, Young Chasers. The crowd were loving every second of it, right up to the finale of ‘T-Shirt Weather’, when smoke canisters were let off, surrounding the Radio 1 Stage in a green haze. Circa Waves built up a good reputation as a live band when touring with The 1975 in 2014 and then on a headline tour. Now they’re doing it at festivals. The ‘modern soul’ duo from London recently expanded to a seven-piece band in order to play ‘more organic’ live music and to avoid reproducing music from their laptops. On Saturday afternoon, Jungle’s drummers, guitarists, keyboardists, vocalists and break dancer filled the stage inside King Tut’s Wah Wah Tent to play through a funky set which included recent singles ‘Busy Earnin” and ‘Time’. 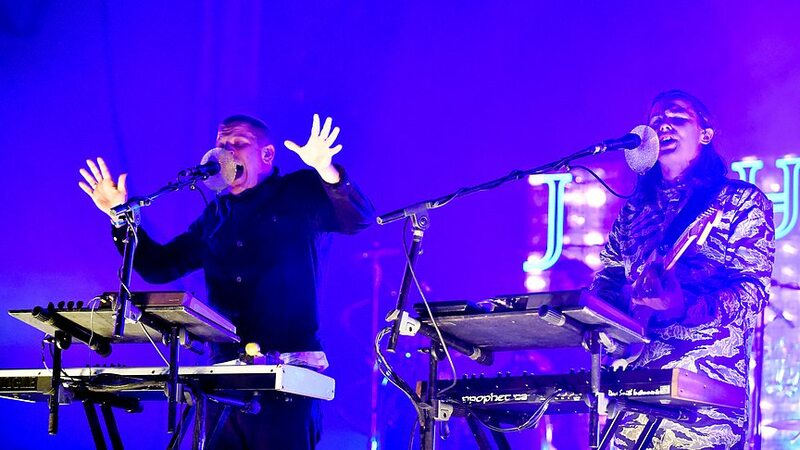 The founding duo of lifelong friends Tom McFarland and Josh Lloyd-Watson have spoke before about putting more emphasis on the aesthetics of the band’s artwork and live performances rather than themselves as individuals. A dimly lit stage with luminous letters spelling out ‘Jungle’ and a little girl break dancer certainly did that. Plus the atmosphere inside the tent was electric as the revellers enjoyed a spot of modern soul. Not even the pouring Scottish rain could dampen the spirits of the large crowd which had gathered in front of the Radio 1 Stage to sing along to The Vaccines’ wonderfully energetic set of indie bangers. Justin Hayward-Young and co had not lost any of the swagger they showed on the Other Stage at Glastonbury two weeks back. They fired through tracks from their new album ‘English Graffiti’ and their previous two successful albums ‘What Did You Expect From The Vaccines?’ and ‘Come Of Age’. Songs like ‘Teenage Icon’, ‘Wetsuit’ and ‘If You Wanna’ got the whole crowd singing along, keeping smiles on the wet faces. The London four-piece brought the show to a close with the fantastic ‘Norgaard’. The second that the Vaccines vacated the Radio 1 Stage, the huge crowd began to rush in the direction of the Main Stage, where Saturday’s headliners The Libertines were about to start. Coming on to pouring rain, The Libertines were led out by Pete Doherty and Carl Barat. 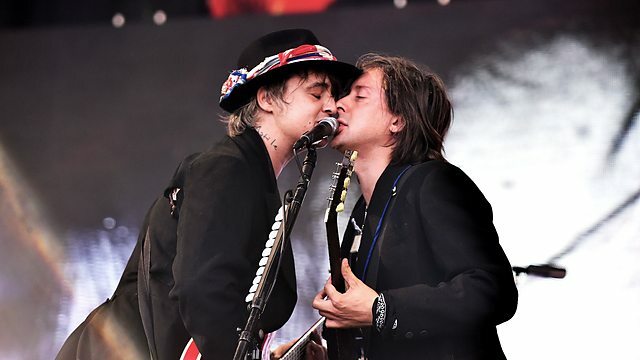 The Libertines are undoubtedly the most talked about band of the moment. With a reunion, a new album on the way, a secret show at Glastonbury and headline shows at T in the Park and Reading and Leeds festivals. The likely lads played a blistering set which incorporated old favourites, songs like ‘Time For Heroes’ and ‘Up The Bracket’ which have became indie anthems. They also played some new material including their brilliant new single ‘Gunga Din’, which prompted on of the biggest sing-alongs of the night. The Libs closed the show with the big ‘un, ‘Don’t Look Back Into The Sun’, which the crowd went wild for. The chemistry between the band looked very strong, and noticeably between Pete and Carl as they shared a mic throughout the set and a big hug at the end of it. Sunday was a busy day for the Radio 1 Stage, playing host to Marmozets, Wolf Alice, Peace, Catfish and the Bottlemen, Jamie T, The Prodigy and more. Luckily, it was the first day of the festival with no rain forecasted. 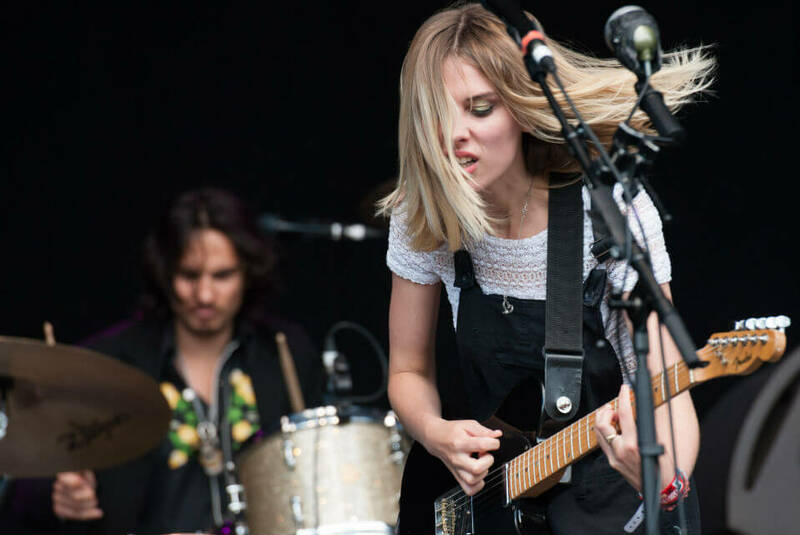 Wolf Alice, while drawing a surprisingly small crowd, really went for it, blasting through a short set of songs from their recently released debut album, ‘My Love Is Cool’, which was only kept off the Album Chart top spot by Florence and The Machine. The North London band, who have repeatedly been named as one to watch by NME, sounded great and it was frustrating that they couldn’t have played later in the day when they would surely have had a broader audience to play to. The last song, Giant Peach, was the highlight of the set, encouraging a sing-along with Ellie Rowsell’s dark lyrics and small circle pit towards the end of the track. 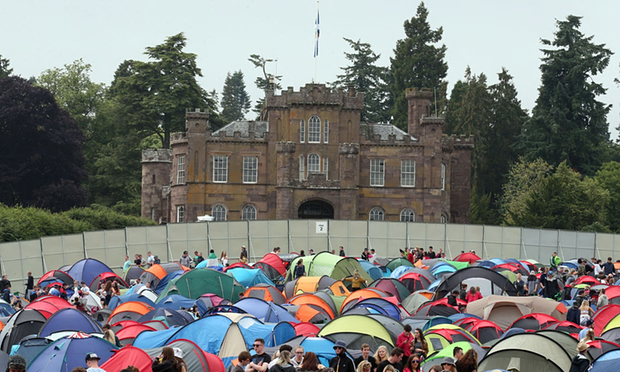 The Brummie boys returned to T in the Park to follow up Wolf Alice on Sunday afternoon. They rushed through a high velocity, 30 minute set of songs such as ‘Money’ and ‘Lost On Me’ from their album ‘Happy People’. They also played two songs, ‘Wraith’ and ‘Lovesick’, from 2013’s ‘In Love’ album. 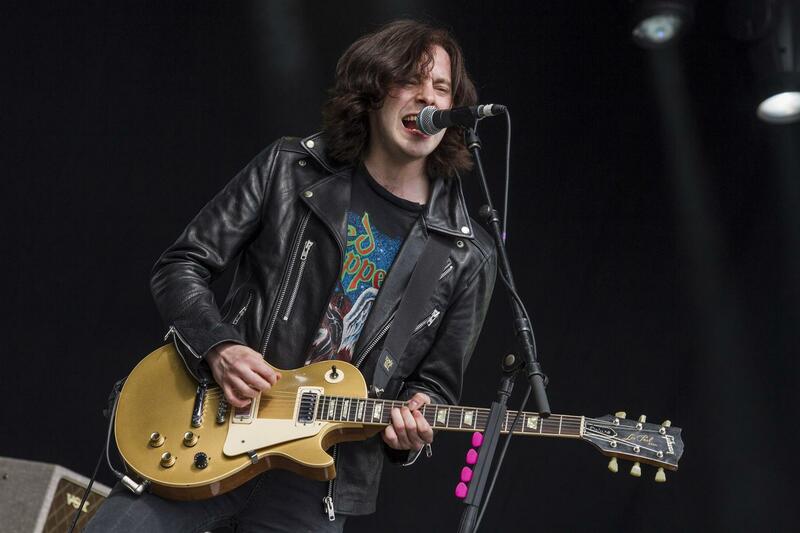 The band’s large cult following were out in force, dancing in the sunshine and revelling in frontman Harry Koisser’s irresistible stage presence. The set was brought to a close by the last track on Happy People, ‘World Pleasure’ which saw the crowd clap along and chant Samuel Koisser’s name through his bass solo. 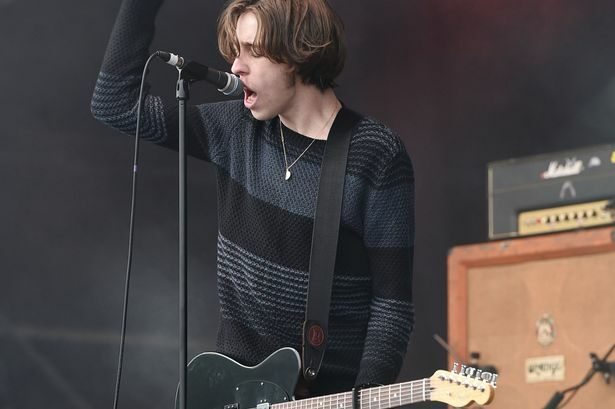 By late Sunday afternoon, when it was Catfish and the Bottlemen’s turn to take to the Radio 1 Stage, there was a massive crowd in front of the stage and the sun was beating down on them. Van McCann and co walked out to a massive roar. Their first song, Kathleen, received an equally warm reception. Playing through a set of tracks such as ‘Pacifier’ and ‘Cocoon’ from their debut album ‘The Balcony’ which was released at the end of last year, the crowd were going mad, setting off smoke canisters, waving Wales flags and throwing around beach balls and other inflatable objects. It’s rare to find a band with such a fanatic as well as massive fan base after just releasing their debut album. The North Wales four-piece closed with ‘Tyrants’, the last song on The Balcony album’s track listing. It was Jamie T’s job to warm up the Radio 1 Stage crowd for The Prodigy- or to send them off happy to see Noel Gallagher headline the Main Stage. 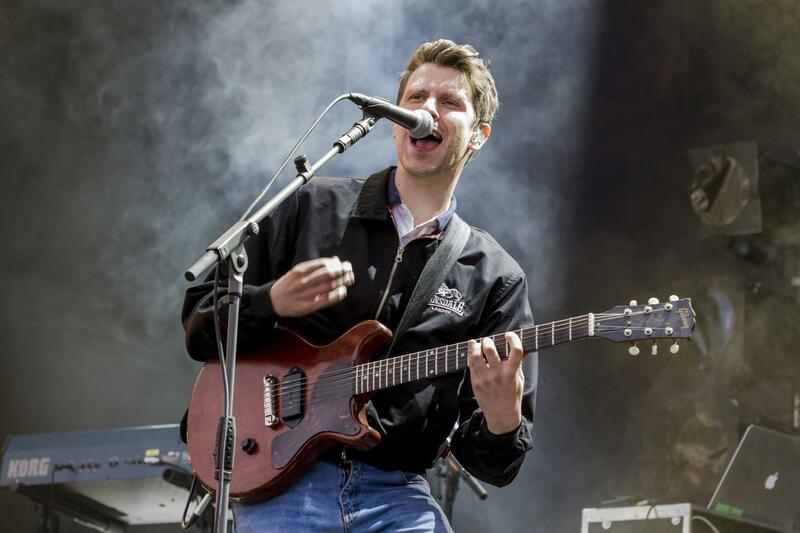 But anyone who has seen Jamie T live, especially at a festival, will know he is much more than a warm-up act. Jamie played a mix of old and new material as the sun began to set behind the trees of the Strathallan estate. He dropped his guitar, grabbed the mic and came down to join the crowd for singalong anthem ‘Sheila’. But he really got the crowd going with his final two songs, ‘Sticks ‘n’ Stones’ and ‘Zombie’. You could tell everyone in that vast crowd was enjoying themselves as the sun went down on the final day of the festival.